Do you hate reaching for something you need only to realize that you’ve run out? If you’re running low on your Cheerios, Totino's Party Pizza or tube of Crest toothpaste, then head to Publix® during the Running Out? Run In. in-store event so you can purchase the everyday products that you love and need more of! Receive rewards for stocking up on some of your favorite General Mills and P&G products at Publix during the Running Out? Run In. event this May. Receive a $5 Publix® gift card to use on your next shopping trip when you purchase $30 or more in participating items during the event (5/17 – 5/23); simply mail in the rebate form found in-store or online at runningoutrunin.com along with your original receipt(s). Myblogspark and General Mills sent me a $25 gift card to Publix and I also have one to giveaway! This giveaway will end Sunday, so please be sure to enter quickly. 1. Tell me what you are looking forward to buying at Publix during this sale. 3. Subscribe to my blog via email...see the sidebar. Leave a message telling me have done so. 4. Tell me your favorite on the run - go to meal. UPDATED Monday May 21, 2012. This giveaway is CLOSED. Thanks for participating! 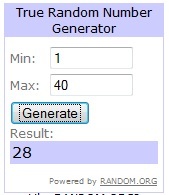 Random.org selected #28 as the winner. Congratulations to Brenda O'Barr! I'm looking forward to buying Cheerios. I do one big shopping trip once a week and I run into the store one other time to buy small stuff like bread and milk. I like an omelette if I'm in a big hurry. I sometimes get a granola bar for on the run, but it's not really a meal. I will get some Dawn during this sale. I shop every Friday at the grocery store. I'd like to stock up on Charmin and Cheerios. My favorite on the run - go to meal is veggie roll. I will stock up on Cherrios! I shop weekly and according to sales. Some weeks not a lot but produce. Our favorite quick go-to meal is breakfast for dinner. Eggs, toast, turkey bacon! YUM. Everyone loves it. I'd get Charmin and Betty Crocker cake mix. I usually shop once a week. I am going to be buying crescent rolls. I shop weekly to get the sale items, and then get the rest from my pantry/freezer. My favorite go to meal is taco salad. I brown ground beef, drain and mix in taco seasoning and a can of black beans. Serve over shredded lettuce with salsa and guacamole (and cheese if you like). I will stock up on cereal! I go shopping every Tuesday. Publix here is always restocked before weekly sale ends. My go to meal is a tortilla wrap. Put whatever leftovers in it for a great meal! Cheerios and Gain, the 2 items we seem to run out of the most :) Thank you! I shop once a week, in between then if we run out, then we run out unless we need milk or bread but I tend to buy enough to last the whole week. I find I save more money shopping once a week rather than stopping in every day or every other day. I also try to shop when new ads are out to match my coupons to the ads. Thanks! Cheerios and milk! Thanks for the chance to win! We usually go shopping once a week. Tacos are our favorite quick dinner! I shop about 3 times a week, just small trips. My favorite go to meal is pizza whether its on french bread or tortillas or fresh pizza dough. I'm purchasing Charmin & Gain!